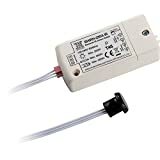 IR sensor Purpose ( double pole sensor ) – touchless switch – put e.g. hand at a distance of 5-10cm to the detector to switch on the circuit. To disconnect the electrical circuit bring up hand again . So the sensor works like a universal switch. the switch can be used in the kitchen , bedroom , living. IR sensor switch and sensor head with 2m cable included.